There are two completely different blackjack variants that carry the name Pontoon. The first one originated in UK and has quite similar rules to the regular blackjack. The second comes from Australia and has many unique rules and features (played without 10s, special payouts on various combinations on 21 and more). Both versions can be played online: the British version kept the name Pontoon, while the Australian game called Spanish 21 or Match Play 21. Here we will focus on British Pontoon (If you were looking for the Aussie one, please check our Spanish 21 section). 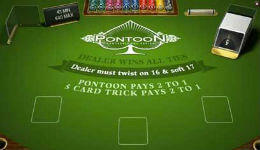 Pontoon is thought to be the first form of Blackjack played. In today’s world, it is mainly played in Australian casinos and online. Obviously, it is a more popular game online since more people have access to it. The game is played much the same as traditional Blackjack and the main target remains the same: to beat the dealer. However, there are some distinct rules that make it quite different. Due to its unique set of rules and low house edge, this is one of the most popular variations of blackjack online and offline. It can be found at online casinos using RTG, MicroGaming, Cryptologic, Playtech and other major software companies. In terms of payouts, NetEnt offers the best winning odds with house edge of just 0.35%. 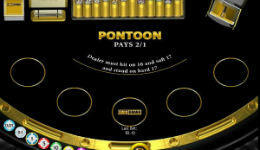 US casino players can play real money Pontoon only in RTG casinos. The goal remains the same, to beat the dealer, but the value of hands and the rules are a bit different. 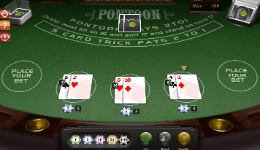 Pontoon is usually played with 6-8 regular decks of 52 cards. 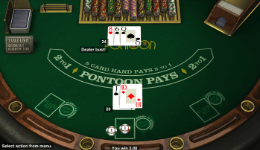 The best hand is Pontoon (blackjack), which means an Ace and 10 value card and it pays 2:1. Last, all 2-4 card hands are ranked according to their regular value and pay 1:1. 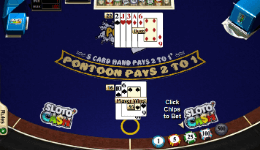 One big advantage of Pontoon vs Blackjack is that the player can twist (hit) after doubling. You can also double at any time, even when you already have 4 cards. To compensate for that, you cannot stand until you reached 15 or higher. RTG (USA): RTG do not reveal the number of decks. Microgaming (British): Dealers stands on all 17s. Player cannot hit split Aces. BetSoft: Split only once, Sweet 16 side bet. NetEnt: Played with 6 decks. You can double only once per round. All Pontoon games online offer an expected return of 99.62%, except the NetEnt version, which stands above the rest with 99.65%. Notice that if you choose to use the Sweet 16 side bet that BetSoft offers, the odds there are lower than in the main game, 97.48%. The options you have are similar to regular blackjack, but they carry a different name: twist (hit), stick (stand) and buy (double). Stand: One clear distinction between Pontoon and regular blackjack is that you can stand only if the total value of your cards is 15 or more (or if you have 5 cards). Splitting: Any two cards of the same value may be split. You can split up to 2 times making for 3 total hands. A bet of equal amount to the original must be placed whenever a split is performed. Aces may be split and doubling after splitting is Aces Is allowed. You will immediately notice some differences right from the start. In most Blackjack games, the dealers 2 cards are 1 up and one down. Here, both dealers’ cards are dealt face down. All players’ cards are dealt face up. The dealer will peek at his cards to see if they have 21, or Pontoon. If the has, the hand is over and the dealer wins all bets. If not, the hand continues. That’s the basics…Now you should now be proficient enough to start playing.